> Joe is back for new adventures! Joe is back for new adventures! There are 19 products. REISSUE Aventure Joe outfit by Captain Cosmos.Geyperman figure, custom head. Contains :- Tshirt and trousers- Helmet- Scarf- Belt- Bazooka- Ammo box- Boots Limited edition. 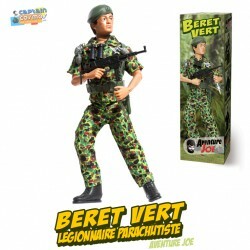 REISSUE Aventure Joe US Marine Corps outfit by Captain Cosmos. Contient :- Jacket and trousers- Helmet- Binoculars- Webbing with bayonet and water bottle- Grease Gun- Boots (figure not included). 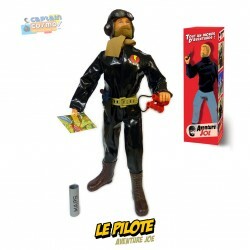 REISSUE Aventure Joe Pilot outfit by Captain Cosmos. Contains :- Jumpsuit- Brown pilot helmet- Goggles- Scarf- Belt with holster- Mauser pistol- Red binoculars (More fun!) :)- Map with box- Brown boots Limited edition, last piece available! (figure not included). REISSUE Aventure Joe outfit by Captain Cosmos. 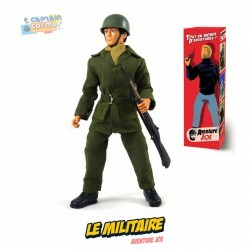 Contains :- Sweater or camo jacket (please choose on the right before buying)- Trousers- Red beret with badge- Binoculars- Webbing with bayonet and water bottle- MAT49 SMG- Boots (figure not included).